When I first moved to Las Vegas in 1999, there was one route that everyone told me I had to do. I had just started grad school and it was still August in Vegas. If that doesn't mean anything to you, then you've never been in desert southwest in August. The average daily temperature was 103 degrees. Cat in the Hat (5.6+, II+) was going to be one of my very first routes in the Canyon that would soon become my home. But it was an inauspicious start. Somehow in our transition from hiking to climbing, the water didn't make it back into our packs. So under the burning sun, we had to bail after the second pitch. I was back a week later to finish the route, once again in the sun. But since that time, I have literally frozen on the route. I've been snowed on. I've been nearly blown off by wind. I've rappelled off in a rain storm. And I've sweated under the hot sun. I know. It doesn't sound that great. But I've also had some of my best days of moderate climbing and guiding on the route in near perfect conditions... Cat in the Hat is like an old friend. A route that will always be there to make me feel at home. 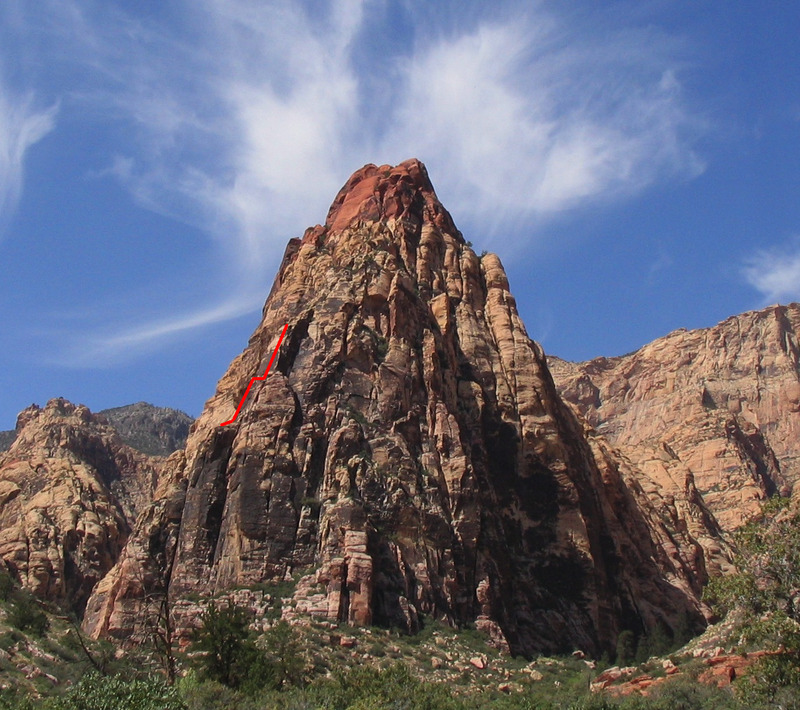 The route is important to the history of Red Rock Canyon as well. The most iconic first ascentionists in Red Rock are George and Joanne Uriosite. The couple moved to Las Vegas in the mid-seventies, but didn't climb much. They were turned off by the amount of sharp brush and the poor rock they encountered on their first forays out. But then in 1976, the pair plus friends Bruce Eisner and John Shirley, began to explore the Mescalito, the prominent feature that that showcases Cat in the Hat on its south face. They quickly discovered the route and made the first ascent after two separate exploratory trips. The quality of the route changed the perspective of the Uriosties. They no longer saw Red Rock as as a chossy heap of scrub filled rocks, but instead as a playground. The pair went on to be part of the small team of desert explorers that made Red Rock what it is today. in the south fork of Pine Creek. The red line shows the top of the route. Cat in the Hat is a six pitch pleasure cruise. The route has lots of nice ledges and that makes it all the more amazing when you reach the final pitch. It's amazing, because suddenly there is significant exposure. The climbing's never hard, but you definitely feel the air beneath you. A climber follows the final pitch of the route. There's something else about the final pitch that makes first time leaders squirm a little bit. The final thirty feet of the route is not too run-out, but it is run-out just enough to make many climbers squirm. That mild run-out is also one of the most memorable of any climb in the area. There are some rules for Cat. First, avoid the route in December and January. The sun is too low and the bottom of the route can be frigid. Second, avoid the route when it's really hot out; there is no shade. And if it's hot, be sure to bring lots of water. And finally, the route's quality also can lead to crowds. My strategy is to start very early, or to start very late. You either want to be there before the crowds, or after. A climber pulls through the final moves of Cat in the Hat. Climbed it 2 weeks ago. It was awesome. Rope got stuck on the way down, but still awesome. Oh yeah it also started to rain while we were trying to free the rope. Still awesome.